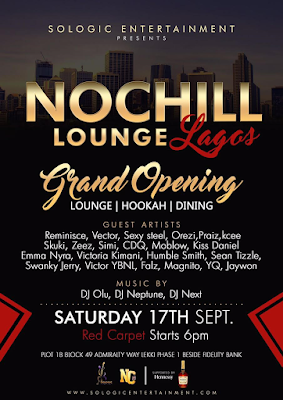 Night life in Lagos is about to spew the chill pill as the all new NoChill Lounge Lagos debuts with a spectacular grand opening this Saturday, 17th September at Plot 1B Block 49 Admiralty way, Lekki Phase 1, Beside Fidelity Bank. The red carpet kicks off at 6pm with a parade of major A-listers. Proudly supported by Hennessy. The NOCHILL Lounge is a subsidiary of Sologic entertainment who is the mastermind behind the Nochill party series covered exclusively by its very own NoChillTV. The new lounge promises to be a night life game changer with extra touches to satisfy its clients. It’s gone an extra mile to provide a captivating atmosphere with great ambience, top notch customer service and hospitality services ranging from the exclusive night club to a full restaurant serving varieties of cuisines to die for; complete with the fastest home and office food delivery services. The tastefully designed lounge drips in exquisite state-of-the-art lightings, beautiful furniture and superb interior and exterior. The shisha lounge serves as the icing; set with the trimmings of the traditional Emirate Hookah/Shisha experience, just like in the heart of Dubai. For those who love to bask in fresh air, there is a sit-out structure where a beautiful view of the Lekki scenery can be savoured while you are served with cocktails alongside grilled food. The opening party is a NO CHILL day, all excitement to the maximum. No holds barred, no bad vibes. Loads of celebrities, social influencers, special shisha flavours, special recipes and celebrity DJs to give the best music mixes. The NOCHILL lounge is a NO CHILL zone, come through but leave your ego at the door step!